Hoya fitchii is a native of the Philippines and was named after Charles Marsden Fitch, a noted photographer and the discoverer of the plant. 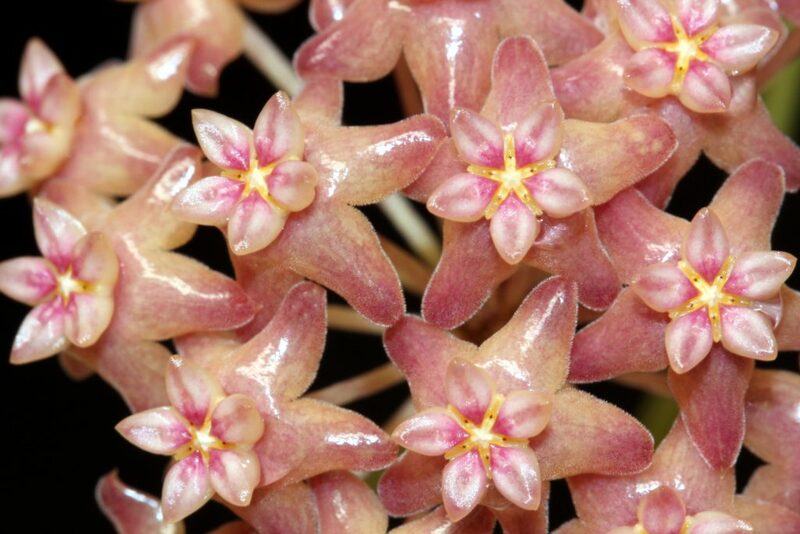 Depending on the conditions under which it is grown, its blooms can show wide variations in color. They can vary from shades of yellows and oranges to pearlescent pinks such as mine. I want to take this opportunity to thank my good friend Patrick Vance for giving me a cutting of Hoya fitchii during the summer of 2015. Without his generosity there would be no Hoya fitchii on this site, as it was not really on my radar. The cutting was rooted directly in, and grown in a very chunky mix containing large bark, charcoal, and perlite chunks mixed with a little peat-based potting soil. It grew and flowered completely under LED and T-5 lights in a humid grow-tent. I watered the plant about ever 7-10 days, and it took about 16 months from cutting to flower. Hoya fitchii is a wonderful little Hoya with beautiful leaves and gorgeous little flowers. It is not particularly difficult to grow and receives my highest recommendation for everyone.